Golden, trumpet shaped flowers fill the air with a clove-like fragrance in spring. Use green berries same as gooseberries. one of my favorite shrubs . Mine have branches up over six feet yet it prunes nicely. great wildlife/bird cover and the flowers are welcome in the very early spring . 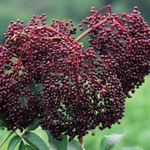 the berries disappear soon as the birds love them. nice fall color . but have never seen a nest in it but does seem suitable. 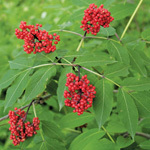 does spread slowly but easy to control if needed - I let mine spread as I love this plant. Q: I was under the impression that there are male and female plants. So the plant will only fruit with both? And are yours specified?--I assume not. Would it be necessary to buy at least 3 plants to be sure to get both. Any way to be sure to get both? A: They aren't male and female, but clones from the same plant will not produce fruit. You need two plants with different genetics. Our plants are not clones, so any two plants planted together will get pollinated and produce fruit. Q: Is golden currant the same as clove currant? Does the one you offer have the same strong scent??? A: They are the same thing, and ours does have a strong scent. 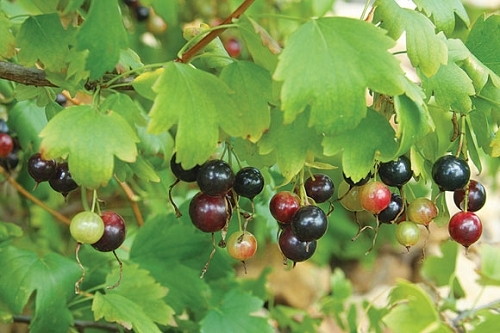 Q: I'm looking for zarina or fatima cultivars of golden currant. Do you have a cultivar, or the wild type? A: We do not have cultivars. Q: What are some good companion plants for Golden Current? A: Fragrant sumac, Solomon's seal, Indian physic, roundleaf groundsel, downy skullcap, columbine, beak grain, and wild geranium could be decent companions.